One of the classes that I’m taking this semester is MECH 102, or better known as DYNAMICS!! )= Honestly, it is one of the hardest courses mechanical engineers are required to take (second only to Vibrations). 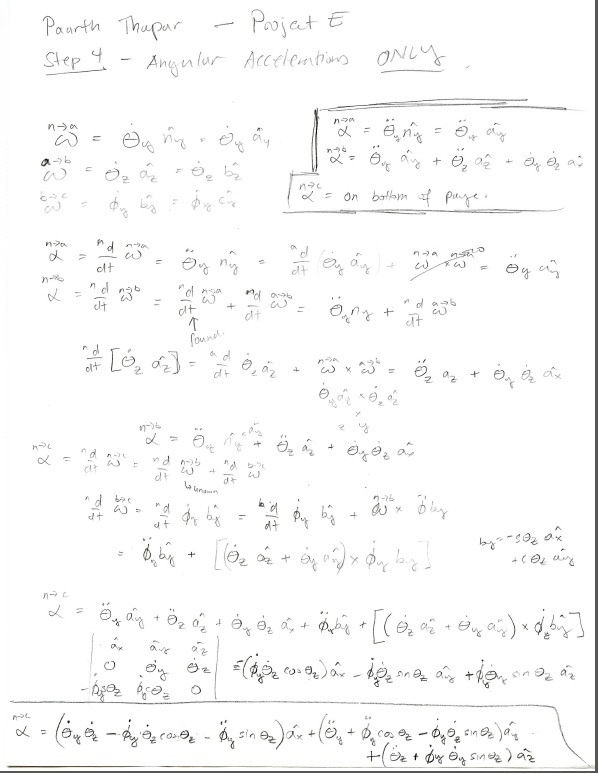 The first half of the course focused on pure advanced vector algebra. We had to learn how to take derivative of vectors in different reference frames and we pretty much did that the ENTIRE time. Sounds easy, right? WRONGGG! The picture right above is one of the portions of the project that everyone has to do. All that was asked of us was to find the angular accelerations. Looks super fun fun fun! But honestly, as much work as dynamics is, it is one of the most useful classes I have taken here at Lehigh, just because of the shear amount of knowledge you have to put together. This is the class where you start putting everything you learned in physics 1, 2 and statics together and start to figure out how a system behaves.